Whether black, purple, red or yellow, everbearing or summer blooming, raspberries are a popular garden plant. 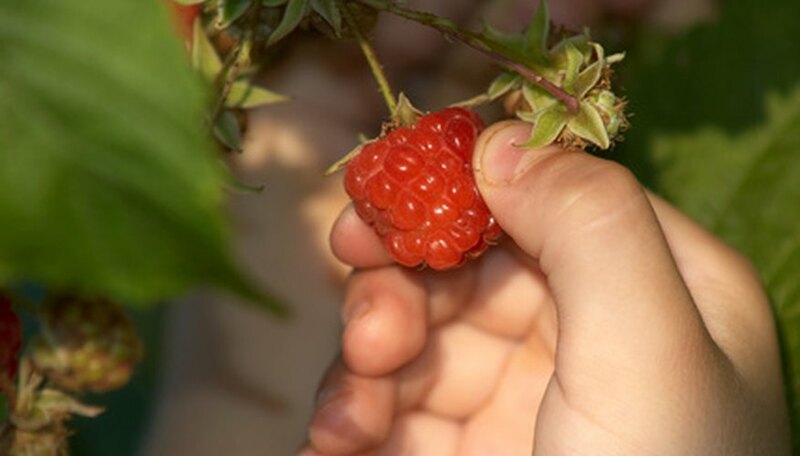 But to produce nutritious and delicious fruit, raspberry bushes requires regular fertilization. These plants are heavy feeders because they produce their fruit on tall canes that they grow every two years. Without regular feeding, your raspberry bush may not have the energy to produce the fruit you love. Spread 2 oz. of a 5-10-15 granular plant fertilizer evenly over the roots of your raspberry plant two weeks after you plant it. Water the soil around your plant with 1 to 2 inches of water to help the fertilizer reach the raspberry plant's roots. Spread 1/2 cup of a 10-10-10 granular plant fertilizer evenly over the roots of your raspberry plant the following spring before the raspberry plant produces new growth. Continue to fertilize the raspberry plant each spring before new growth begins. Do not fertilize raspberry plants in the late spring or summer.